Rural doctors in China say they would like to provide more public health services but they are not paid much for such services and need to earn a living though fee-for-service medicine. In a series of interviews with 10 groups of village-level basic doctors, researchers found that the rural practitioners felt under-appreciated and underpaid, despite receiving extra subsidies under the governnment's Health System Reform Plan introduced in 2009.
health services provision and disease surveillance activities. According to Dr Yan Ding of the Institute of Public Health, Heidelberg University and Professor Dong Hengjin of School of Public Health, Zhejiang University School of Medicine, the main concern of village doctors appeared to be that providing public health services was time-consuming and limited their ability to perform fee-for-service medical care. felt their effort was not valued by the government. Although subsidies for public health work increased in 2011, all the village doctors interviewed considered it insufficient when compared with the amount of work expected of village doctors. They also remarked that they had no pension to fall back on when they retired, so needed to prioritise earnings and save. The health reform subsidies were intended to revitalise the provision of basic public health services by improving the ability of the three-tiered system to strengthen disease control and health promotion, as well as providing a package of basic public health services. This package includes establishing health records for all citizens; screening for major diseases for elderly people, women and children; managing chronic non-communicable diseases; providing health education; increasing vaccine coverage for 15 vaccine-preventable diseases; implementing prevention and control programs for major infectious diseases and geochemical endemic diseases; and ensuring that births occur in hospitals. 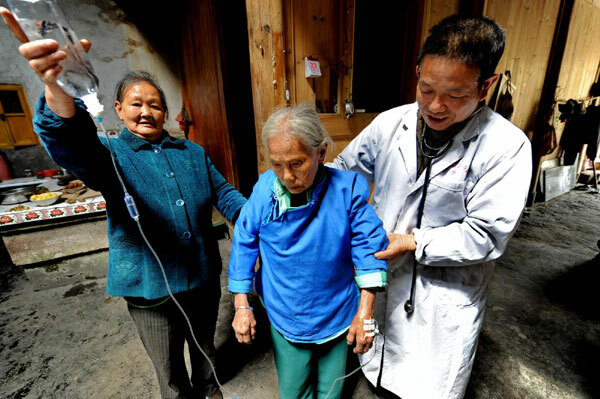 To motivate village doctors to provide these preventive services, the government pledged per-person subsidies of 15 renminbi (RMB) for 2009 and 2010, and 25 RMB for 2011. "An interesting finding is that although village doctors prioritise medical services for which they can charge, they do their best to deliver preventive services that are part of the basic public health package. They claim that providing public health services involves a significant investment of time that has a negative impact on other income-earning activities. Village doctors also question the extent to which they and their public health work are valued," the researchers note. The conclude: "Improving the delivery of public health services by village doctors is likely to require an increase in the subsidy, improvement in the supervisory relationship between village clinics and township health centres and the creation of a government pension for village doctors."